Through victory after victory, large and small, we have shown that no amount of suppression can block the road out – so long as Sea Org members are there to protect it and strengthen its foundations. In the past year, our sphere of influence has continued to grow, more and more people have learned the truth about Scientology, and even SPs got the message: To go up against Scientology is to go up against dedicated Sea Org members – and the Sea Org always emerges victorious, no matter the persistence required. 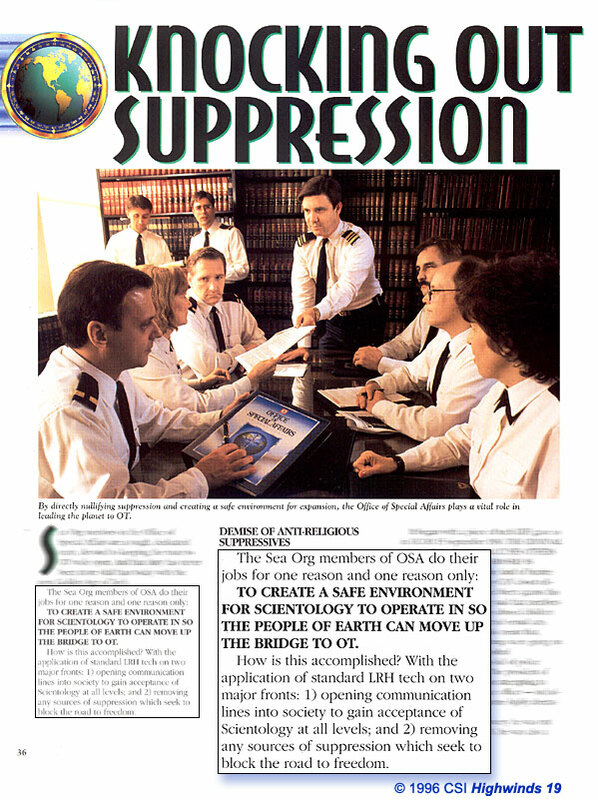 The Sea Org members of OSA do their jobs for one reason and one reason only: TO CREATE A SAFE ENVIRONMENT FOR SCIENTOLOGY TO OPERATE IN SO THE PEOPLE OF EARTH CAN MOVE UP THE BRIDGE TO OT. How is this accomplished? 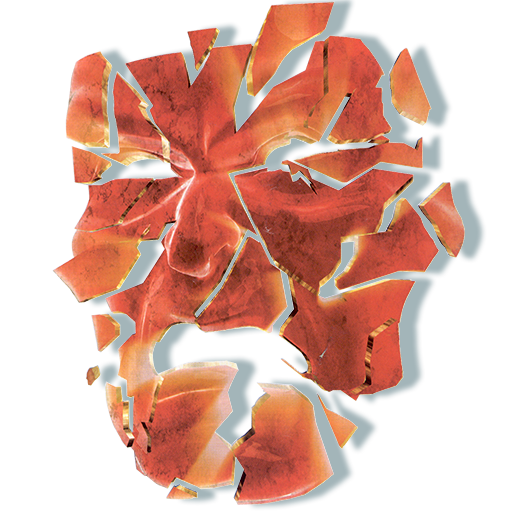 With the application of standard LRH tech on two major fronts: 1) opening communication lines into society to gain acceptance of Scientology at all levels; and 2) removing any sources of suppression which seek to block the road to freedom. Over the years it has been found that the tactics of certain government agencies involve sending plants into our organizations. The system used by the US government in intelligence matters—all services—is to put a “clean” officer in charge of people with criminal records who have something held over them and who can be used as plants. This is as antique as other US intelligence tech. It is from the Dark Ages. But it permits you to detect one of their plants: He or she will have some sort of criminal record. Thus if you want to safeguard against plants or narrow down the field, look for criminal connections or records. If you find a plant and prove that he or she was sent in by some government agency, this would then be of benefit in any suits against the government. What is really wanted is factual, court-provable evidence that a plant was put in an org by one or another government service. Plants sing or can be doubled. Sometimes it takes other evidence to back down the blackmail the government has on them. They are not there out of any patriotism. So they turn into victims very easily. An example of this was a plant who was sent into an organization by a government agency using blackmail. This plant managed to get into a staff position, stole financial records and money from the org and blew. The staff members who were handling this situation used a legal instead of intelligence method of handling—they sued the plant which brought about chaos. A quiet personal touch approach to the plant and the grand larceny threat might have done a great deal while a battering arrest got nowhere. One must realize that arrest processes are not effective today and courts are not trustworthy in such matters—as proven by the high crime rate. Intelligence processes are effective in such matters as they are in effect intelligence matters. So if you suspect government infiltration, your instructions would be to find, identify and prove a plant if at all possible. Then use the fact in various suits—but don’t sue the plant. An Intelligence report can be totally correct. But if its TIME is not included it can also be totally wrong. Example: Sample report says “Whites are being shot down in West African ports.” So we conclude we better not enter any. Then we learn the time of the report—1960! Some difference! Boy, when you make a report, always put in WHEN. And before you accept one be sure there’s a WHEN attached. Our scheduling of port visits was going all awry because a report that was really old was being accepted as current! 1. Intelligence staff become aware of a possible source of antagonism. 2. They clip, gather and cross-index file all the data they get on this source of antagonism, being careful to open and establish files for every individual connected and every organization connected. 3. Then they look over the files and select the biggest one. 4. Then they take a look at who they have or what organization they have. If they have an organization they look for who. 5. Now they investigate the person like mad. This was done with the people who were giving us trouble—Intelligence found the National Mental Health Association and a lead line off into banking and into the Air Force. They haven’t looked at who in banking or at who in the Air Force. They may find further cross-connections and come up with ONE PERSON. This is what should be happening. Plot a government — any government on Earth today — as you would plot an individual on the tone scale.2. A murderer, a non-producer, a thing unable to run engrams — in short, an insane person. The invention of the “official act” as different from a “personal act” was the beginning of governments sufficiently insane to cause war. Definition of an insane person: An individual who is not personally responsible for his own acts. Definition of a public official: An individual who is not personally responsible for his own acts.